n July 2009 Nawshirwan Mustafa decided to convert his Washa company into a political movement which he called Gorran, which means ‘Change’. The Party’s main slogans were against corruption and for an independent judicial system and more equality. During a short period of political rallies the movement managed to attract lots of people from all walks of life for two reasons. Firstly, the most dominant culture in Kurdish society is one of corruption which has destroyed a lot of growth and heightened inequalities, which meant that people were looking for leadership to take them in a new direction. Secondly, the charismatic leader Nawshirwan had attracted a lot of people over time due to his involvement in Kurdish movements for most of his life. These reasons led to Gorran winning 25 out of 111 seats in the Kurdistan Parliament. Gorran became an active and viable opposition through its MPs, broadcasting, and newspapers. However, the Gorran leadership had never expected this volume of votes to be gained in so a short a time and consequently it wasn’t prepared for the resulting political upheaval. More people joined the Gorran leadership and a challenge emerged within the party from some younger figures who wanted a real sense of belonging to and being able to shape the movement. However, in the ensuing four years in opposition Gorran did not reshape or improve the standard of politics for ordinary people. Gorran also did not change its Chinese style of leadership. The chairman still remains a big shadow in the movement. In his visits to other leaders locally and abroad he is never accompanied by reputable, constructive politics. Again history repeats itself as we see that the Gorran movement has become another party essentially consisting of the tribes of a few families. And all the corrupted leaders who have pocketed millions in oil money and taxes still have all their assets intact and the Gorran leadership continues to befriend them. In the July 2014 election Gorran got a result almost mirroring that of 2009; it did not gain real ground due to its failure to attract and retain new supporters. Gorran was now exhausted and decided to participate in the KRG (Kurdistan Regional Government) Cabinet, which took almost a year of talks to build. Gorran had three ministers in two of the KRG’s paramount departments: defence and finance. Yet it failed to appoint professionally experienced, educated people to these posts. The Gorran leadership also appointed one of its members to the post of Leader of the Kurdistan Parliament. From the very beginning Gorran had advocated a populist approach, whilst sacrificing a lot in terms of not having clearly defined policies, in an attempt to win more supporters from all walks of life. This happened to such an extent that many of their TV programmes consisted of interviews with representatives from the Kurdish Islamic movement. But, during almost two years of Gorran’s participation in the Kurdish cabinet, they have not managed to establish any positive relationships with the KDP, and as before they have been involved in most of the skirmishes inside Parliament. The KRG Parliament’s Leader of the House failed to maintain the neutrality of his office and most of the time sided with party advocates. The KDP was looking to Gorran for an excuse to destroy the KRG Parliament and Gorran granted them some excuse – although, of course, the KDP’s actions against parliamentary democracy remain fundamentally inexcusable. To escape from pressure from his followers and the deadlock of Kurdish politics, Gorran’s leader travelled to the UK in November 2015 where he also received medical treatment for his chronic back pain. On his return to the south of Kurdistan in April 2016, it became apparent that during his stay in London he had forged a pact with the PUK to try and marginalise the KDP. The great novelist George Orwell wrote in the late 1930s that the problem with Marxists is that they do not have a clue what is going on in ordinary people’s heads. This observation has relevance to Gorran today given its founder’s political antecedents. Politics have stood still since then because Gorran has failed to deal with the KDP which, albeit a confirmed tribal movement, is the oldest and largest political party of Kurdistan. Gorran should instead have worked to marginalise the PUK while coming to a pragmatic but principled understanding with the KDP in the bests interests of the people of Kurdistan. Since Gorran took their place in the KRG, nothing has moved in Kurdish politics; contrarily the atmosphere has became more hostile towards the KDP’s president — who they challenged without putting up an alternative for the post — and leadership. Gorran has abandoned their main strategy which was not to get involved in in-fighting and corruption. 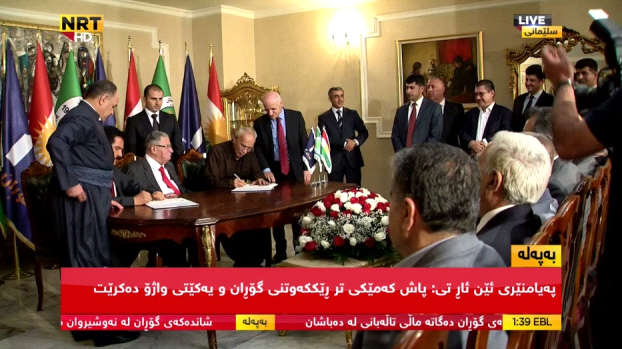 Instead, in their pact with the PUK they have now become part of that corruption, and so the old story repeats itself. A lot of members of Gorran have ripped up their membership cards and several members of the national executive have raised their voices against this worthless agreement and resigned. Gorran’s revolution has become the dead fish in the sea of Kurdish politics and society. My recent visit to the area and my observation tells me that if tomorrow were election day, Gorran could not gain more than 10 seats. Gorran is no longer the party of change and it has not educated the masses for revolution and reform. The Gorran movement and their leadership need to make an immediate review of their policies over the last six months and it is important for Gorran to reach an agreement with the KDP, not the PUK. Gorran has failed the half million voters of the south of Kurdistan who voted for change and reform. Furthermore, before it is too late, its young leadership now needs to step up to become the voice of the movement and real champion of popular aspirations.